FTP file services on OES 11 SP3 servers are provided by Pure-FTPd, a free (BSD), secure, production-quality and standard-conformant FTP server. The OES implementation includes support for FTP gateway functionality as on NetWare and offers a level of integration between eDirectory and Pure-FTP that allows users to authenticate to eDirectory for FTP access to the server. Before installing Pure-FTPd, make sure that users requiring FTP access are LUM-enabled and have access rights to the areas on the server they need to use. To install Pure-FTPd, select the Novell FTP Server pattern in the OES 11 SP3 installation. 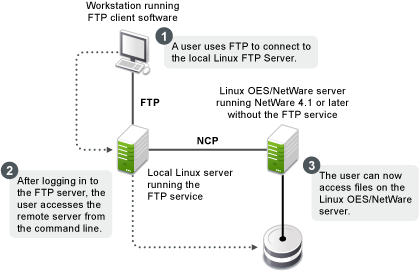 The FTP server supports a home directory for users on local and remote NCP servers. The remote server can be an OES server. When the home directory is set for the user in eDirectory, the user is placed in the home directory on successful login to the Linux server. Pure-FTPd supports three levels of home directory, default home directory, a user specific home directory on the local system, and a user specific home directory identified by the value set in eDirectory. The POSIX home directory is the directory that is available by default on POSIX file systems. The POSIX home directory is defined at the file system level and cannot be disabled. An administrator can set the home directory for eDirectory users as part of the User object in eDirectory. On successful login to the FTP server, the user is placed in the home directory set in the user object. The User's home directory can exist either on the OES server that is hosting the FTP service or on any other OES server in the same tree. A new EnableRemoteHomeDirectory option is now available to support this home directory. By default, this option is set to NO and the home directory set for the user in eDirectory is ignored. To enable eDirectory based home directory support, you must set both EnableRemoteHomeDirectory and remote_server to YES. FTP will then read the user’s home directory from eDirectory and mount it locally. DefaultHomeDirectory indicates the path to the common home directory for all FTP users. On successful login to the Pure-FTPd, users are placed in the default home directory. The default home directory can be local or on a locally mounted NSS path or on a remote NCP Server. It can be either an NCP volume or an NSS volume and it can be configured by using the DefaultHomeDirectory and DefaultHomeDirectoryServer settings. If the home directory is on a remote server, use DefaultHomeDirectoryServer, and set it to the IP or DNS name of the remote NCP server. As with any NSS volume, the FTP client should have required rights over the NSS volume whether DefaultHomeDirectory is on a local or remote server or not. The DefaultHomeDirectoryServer option is now available to differentiate whether DefaultHomeDirectory is on a local or remote server. By default, this option is set to NO so DefaultHomeDirectory points to a local path. To set DefaultHomeDirectory to point to a remote NCP server with a DNS entry, you must specify the full path to the remote server, including the volume name. For example, DefaultHomeDirectory /ftphome. You must also set both DefaultHomeDirectory and remote_server to YES. NOTE:If DefaultHomeDirectory path is a POSIX path (non NCP volume) then it is supported only on local FTP server and not on remote server. In that case DefaultHomeDirectory path should be /home/commonpath (any POSIX path) and DefaultHomeDirectoryServer should be Null or commented. Support for backslashes in input path is provided. Using FTP client on Windows, you can use backslash as separator in the path. allow_backslash_in_path option is now available to allow back slash in the path. By default the option is set to NO. To configure the Pure-FTPd server on OES 11 SP3, edit the /etc/pure-ftpd/pure-ftpd.conf file. NOTE:It is very strongly recommended that you read through the entire /etc/pure-ftpd/pure-ftpd.conf file and be familiar with the available parameters and settings. For complete details, refer the pure-ftpd man page. The following table lists the recommended configuration parameters for Pure-FTPd. Default home directory of the user. Maximum numbers of clients that can simultaneously access the server. Port range for passive connection replies. Range must be a minimum of 2*MaxClientsNumber. Allows the user to browse outside the home directory. Allows to differentiate whether DefaultHomeDirectory is on local or remote server. Supports eDirectory based home directory. Allows Windows user to you use backslash as separator in the path. Start the Pure-FTPd server using the rcpure-ftpd command. Pure-FTPd is loaded by using a configuration file. Multiple instances of Pure-FTPd can be loaded using different configuration files. By default, an instance of Pure-FTPd using /etc/pure-ftpd/pure-ftpd.conf file is loaded at the boot time by init.d script. For loading multiple instances, new configuration files need to be created. Create a new configuration file for each instance. For example: Copy /etc/pure-ftpd/pure-ftpd.conf to a different location. Rename the file to pure-ftpd1.conf and move it to /etc/opt/novell/pure-ftpd1.conf. PIDFile: Points to the full path of the PID file created by the pure-ftpd instance. PID file is used for unloading a particular instance of pure-ftpd. Hence, ensure that the PID File path is unique for every instance. Bind: By default, pure-ftpd binds to all the IP addresses on the system and listens to requests over port 21. Modify the settings of the bind such that all the pure-ftpd instances bind to different IP addresses or port combinations. also, modify the settings in the /etc/pure-ftpd/pure-ftpd.conf to avoid any IP address or port conflict from the second instance. For example: If a system has two interfaces with two IP addresses 10.1.1.1 and 10.1.1.2, then the bind setting for two pure-ftpd instances can be Bind 10.1.1.1,21 and Bind 10.1.1.2,21. For example: /usr/sbin/pure-config.pl /etc/opt/novell/pureftpd-confs/pure-ftpd1.conf loads an instance using the config file /etc/opt/novell/pureftpd-confs/pure-ftpd1.conf. The ps –eaf | grep pure-ftpd command lists all the instances of pure-ftpd loaded on the system. The PID file as specified using the PIDFile entry in the configuration file has been created. An FTP connection from the client to the server over the IP address being used by the pure-ftpd instance can be created. A new script, pure-ftp-stop.pl, is added to unload an instance of pure-ftpd and all its child processes. The full path of the configuration file used to load the instance of pure-ftpd must be passed to the pure-ftp-stop.pl script. For example: /usr/sbin/pure-ftpd-stop.pl /etc/opt/novell/pureftpd-confs/pure-ftpd1.conf unloads the instance of pure-ftpd that was loaded using /etc/opt/novell/pureftpd-confs/pure-ftp1.conf. The PID file of the pure-ftpd instance is also used for unloading the pure-ftpd instance. The PID file specified using the PIDFile entry in the configuration file has been deleted. The number of instances displayed by ps –eaf | grep pure-ftpd is reduced. An FTP connection request to the server errors out. After logging in to the eDirectory tree, users can access files and directories on a remote Linux server whether or not the server is running Linux FTP Server software. The remote server can be another Linux OES server. This section describes how to configure and use the Remote Server Navigation feature. The NCP protocol lets you transfer files and navigate to and from remote OES servers. File operations such as get, put, and delete can be used on the remote server, even without changing the directory path to that server. The double slash (//) indicates that the user wants to access a remote server. After the double slash, the first entry must be the name of the remote server. Enables remote server navigation for the Pure-FTPd server. Disables SITE SLIST command for listing OES machines. Option yes restricts users to login only to his home directory and cannot navigate to other directories including remote OES servers. Option yes allows only anonymous logins. NOTE:The Linux FTP Server does not support wildcards at the root of the server. The SITE command enables FTP clients to access features specific to the Linux FTP Server. NOTE:The settings done through SITE commands are valid only for the current session. This command is unique to the Linux FTP service and are not standard FTP commands. Lists all the OES servers within the eDirectory tree. Site list command accepts an eDirectory context in LDAP format. By default, site slist command lists all the NCP Servers in the entire tree. When context is passed to the command it lists all the NCP Servers within the context. NOTE:All the FTP users needs to be LUM-enabled on the FTP server. This command is to enable or disable ascii based file transfer. If this is set to YES, all the file transfers are done in a binary mode and the client command 'TYPE A' is ignored. You can configure Pure-FTPd server in active/active mode of Novell Cluster Services. Novell Cluster Services is installed and setup. For step-by-step information on setting up Novell Cluster Services, refer to Installing, Configuring, and Repairing Novell Cluster Services in the OES 11 SP3: Novell Cluster Services for Linux Administration Guide. In active/active cluster mode, multiple instances of FTP server runs on a single node cluster. Pure-FTPd must be associated with a shared NSS volume and the DefaultHomeDirectory of users must be on the shared NSS volume. Install pure-ftpd on all the cluster nodes by selecting Novell FTP in the OES install. Upgrade pure-ftpd on all the nodes with the test RPM. Enable hard links on the shared NSS volumes. The Bind setting in the configuration file is same as the IP Address of the virtual server created for the NSS pool. The PID file must be unique for each FTP instance running on the cluster. Copy the configuration file to the shared volume to /etc/opt/novell on the shared volume. Copying the configuration file to the shared volume, the file is automatically moved across the nodes with the volume and is always available to the FTP Server. For example: If the shared volume is FTPVol1, the path to copy the configuration file is /media/nss/FTPVol1/etc/opt/novell/pure-ftpd. Configure all the FTP servers for DefaultHomeDirectory support. As NSS volume is shared, the DefaultHomeDirectory in the configuration file must be on the shared volume. For example: If FTPVol1 is the shared volume attached to an FTP Server, DefaultHomeDirectory in the configuration file is /media/nss/FTPVol1/FTPShare. Update the load and unload scripts of the cluster resource. For example: If the shared volume is FTPVol1 and the Pure-FTP configuration file is /etc/opt/novell/pure-ftpd/ftpvol1.conf on FTPVol1, the pure-ftpd load command in the load script is exit_on_error /usr/sbin/pure-config.pl /media/nss/FTPVol1/etc/opt/novell/pure-ftpd/ftpvol1.conf. Configuration file path must be same as the one passed to pure-config.pl in the load script. NOTE:In iManager, load and unload the cluster resources. Pure-ftpd instances must be loaded along with the shared NSS volumes. During the migration process, the pure-ftpd instances alongwith the associated shared volumes are moved across the cluster nodes. You can also migrate an existing FTP server configuration from a NetWare server to OES 11 SP3. For migration instructions and a brief FAQ, see Migrating FTP to OES 11 SP3 in the OES 11 SP3: Migration Tool Administration Guide. FTP and other services require the novfsd daemon. Applying the May 2014 Scheduled Maintenance Update puts novfsd into an unsed state. To restore novfsd functionality, reboot the server. After the server reboots, the daemon always runs irrespective of its previous state. This issue does not exist if you upgrade to OES 11 SP3.